Shockingly over the weekend a Judge ruled that “the right to keep and bear arms” ACTUALLY included bearing arms. In Palmer v District of Columbia, Federal Judge Frederick Scullin Jr. ruled that the Second Amendment existed OUTSIDE a person’s home. With a decision so obvious I do wonder why it took 5 years to issue this decision. That wording is important. According to the correct ruling of Judge Scullin, the right to bear arms is just as paramount as the right to keep them. And there is NO BASIS in which that right should be denied. Furthermore, when Judge Scullin says that the courts cannot uphold a ban under ANY level of scrutiny, he is referring to the three judicial levels of scrutiny that judges use when dealing with whether a law is able to be enforced. These levels are rational basis review, intermediate scrutiny and strict scrutiny. With strict scrutiny a law must be justified by a compelling government interest, narrowly tailored, and must be the least restrictive option to achieve that interest. Obviously blanket gun bans that deny the rights of law abiding citizens do no pass this level of scrutiny. With intermediate scrutiny, a law must be pertaining to an important government interest in a way that is substantially related to that interest. Once again, to say that lowering crime is the government’s interest, how does disarming the law abiding and turning them into potential victims substantially do that? But according to the ruling handed down by Judge Scullin, EVEN THIS level of review cannot merit a total gun ban on the law abiding citizens of Washington DC. What does this mean? Well, until the DC gun grabbing machine regains its footing to put together some draconian licensing scheme, Washington DC is currently a Constitutional Carry City. That is to say, they cannot arrest any law abiding citizen for carrying their gun in the city. DC Police Chief Lanier, with guidance from the Attorney General, has informed his officers not to arrest any person who is carrying a handgun that they legally are allowed to posses. DC residents would still need to have said weapon registered but that does not apply to out of state visitors. With that being said, Lanier reminds people that this only covers handguns as the ruling did not specifically address shotguns or rifles. Also the Assault Weapons Ban is still in effect in DC along with a 10 round magazine limit. So the only gun arrests now in DC can be DC residents with unregistered guns and non-residents who are prohibited under federal laws. As I said before, I’ve no doubt that this will be short lived as gun hating city politicians will no doubt move quickly to try and once again subvert the Constitution and the liberty of the people. But for now, the law abiding have been unshackled in our nations capital. 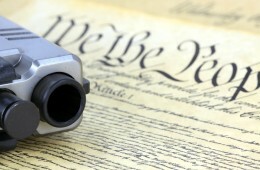 What do the gun grabbing zealots in DC’s city government have to say? A whole lot of “no comment.” Which is a lot smarter than the verbal diahrea that City Council Chairman Phil Mendelson started to spew. Let’s break that down. First, only one president has been assassinated in the past 110+ years and that was with one or maybe more shooters in grassy knolls and book depositories as he was driving down the street in his convertible. But Lincoln, Garfield, and McKinley? The way Mendelson makes it sound is as if the LAST four presidents were assassinated. Mendelson, though he probably doesn’t realize it, is one of those gun grabbers that points to the abject failure of gun control to support his claim that MORE gun control is needed. Just look at it, up until Saturday there was a total ban on carrying guns, yet President’s were shot at, the White House was taking fire, DC is the murder capital of the US and so on. Obviously, the gun ban isn’t working. So maybe…juuuuuuuust maybe, Mendelson’s claim that DC must be more heavily restricted than any place else in the nation is EXACTLY what is WRONG. But they will most assuredly try. The fight is not over…it has merely begun. Fortunately we have gotten off on the right step. Congratulations America…you have a capital that is a little less oppressive. Let’s work to keep it that way.